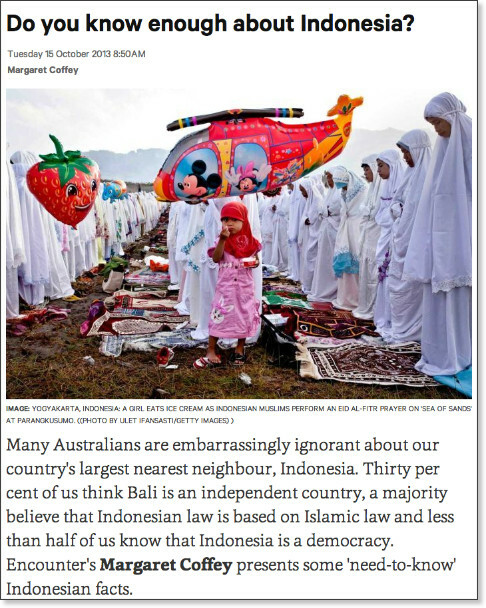 An interesting article about the continuing ambivalent attitude of many Australians to Indonesia. How much do you know about Indonesia’s upcoming election and about the most influential political personalities? As the 3rd largest democracy heads to the polls, AIYA NSW brings the campaign to Sydney. 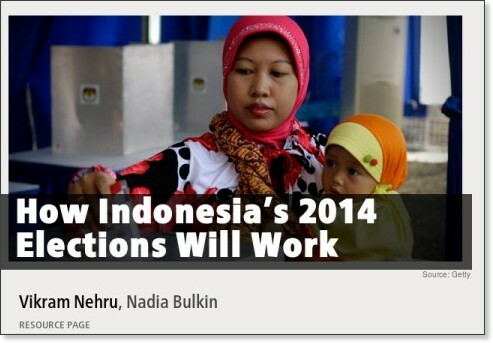 The ‘2014 Indonesian Election Preview’ will feature a simulated political campaign involving discussion on some of the key political parties vying for electoral success. Join in the atmosphere as we give you a closer insight into this monumental election, and how the recent Jokowi announcement has changed the game. They will share their insights and expertise on Indonesia’s election process and the various political parties, in an innovative and punchy format that will truly make this an Australia-Indonesia night to remember! This is a FREE event, and light refreshments and drinks will be provided. Please RSVP your attendance by registering on Eventbrite. There are limited seats available in the Mitchell Theatre at the Sydney Mechanics’ School of Arts, so be sure to get in quick! Please spread the word to any NSW-based friends, family and networks that will be interested in attending. The venue is located at 280 Pitt St, Sydney, which is less than a five-minute walk from Town Hall Train Station. Please email nsw@aiya.org.au if you have any questions about the event. Stay tuned by checking our Facebook page for regular updates on the speakers and activities that we have in stall for the night! An interesting summary of the upcoming elections in Indonesia in April and July this year. An interesting short story about Sharia police in Banda Aceh enforcing regulations that young people say is excessive. News reports about the Australia-Indonesia relationship in the wake of phone tapping and spying allegations have reached fever pitch in the media. Are your students disucssing this in your classrooms? It is interesting to see how the news is being reported in each country. 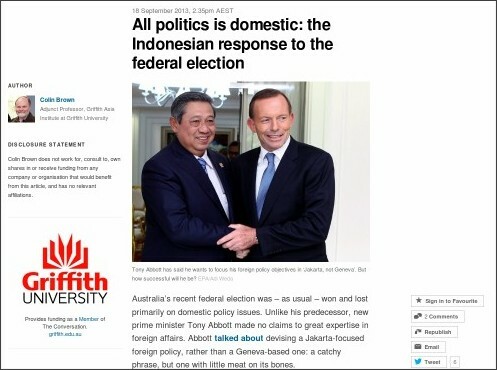 Below is just a small selection of recent news items from both the Indonesian and Australian media. Follow the topic on Facebook, Twitter and other social media for instant updates. Dr Ross Tapsell from the ANU (interviewed on SMH TV) says more depth to the Australia-Indonesia relationship is needed. 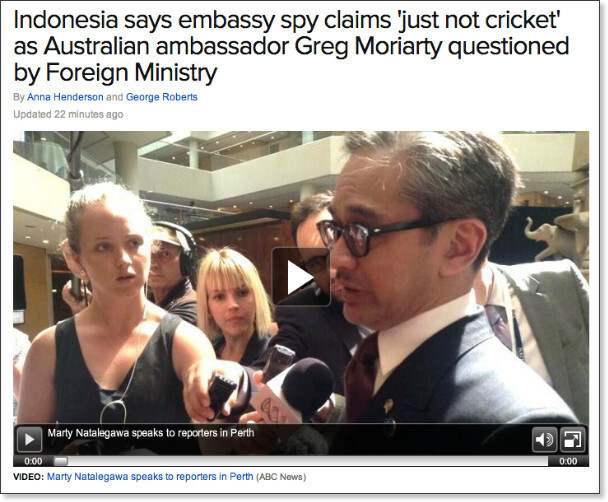 The Indonesian government says suggestions Australia has been spying on the country from its Jakarta embassy have frayed diplomatic relations and trust between the two nations. On his first visit to Indonesia, Prime Minister Tony Abbott has announced the establishment of the Australian Centre for Indonesia Studies. The Centre's mandate will be to strengthen and deepen Australia-Indonesia business, cultural, educational, research and community links. The Centre will also promote greater understanding of contemporary Indonesia and its growing importance to Australia.